26/02/2001: Love What You Do released. 26/02/2001: Neil Hannon attends the Brit Awards, Earls Court, London. 07/03/2001: Regeneration album released in Japan with two extra bonus tracks: 'Edward The Confessor' and 'Soul Trader'. 09/03/2001: Regeneration album released in Ireland. 12/03/2001: Regeneration album released in UK. The day before a promotional disc called RE:Regeneration is sold with the newspaper The Independant. 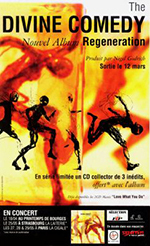 13/03/2001: Regeneration album released in France. 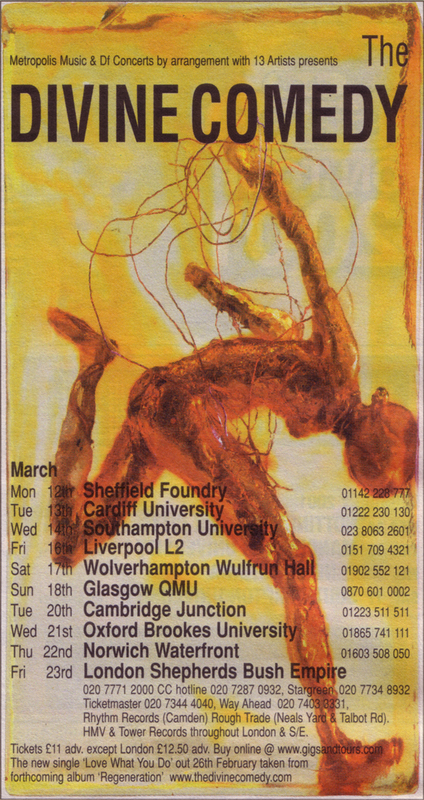 18/03/2001: Regeneration enters UK charts at No.14. 01/04/2001 ? : The Divine Comedy gives a signing session at the FNAC Lisbon. 09/04/2001: Release of Yann Tiersen's album L'Absente, on which Neil has co-written the song 'Les Jours Tristes' with Yann Tiersen. An instrumental version of the song will feature the soundtrack of the film Amélie. 30/04/2001: Neil Hannon is at the Sony Radio Awards, Grosvenor House, London. 07/05/2001: The release of Bad Ambassador is canceled. 09/05/2001: ITN Lunchtime Live - ITV ? 14/05/2001: Bad Ambassador released this day instead of the 7th of May. 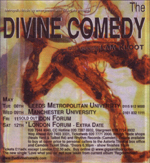 22/05/2001: Claire Burbridge, Joby's wife, exhibits some of her paintings in Oxford in the Auditorium at Magdalen College until the 23rd of June. Some of her work has been used for the Regeneration's artwork. 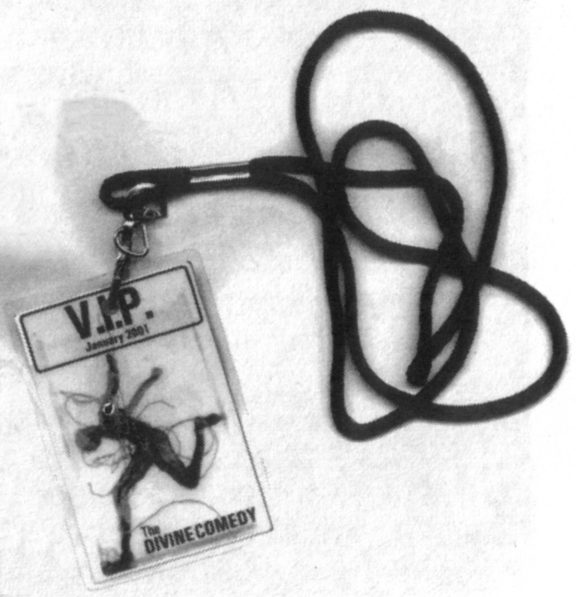 08/2001: The Divine Comedy sign to the U.S. label Nettwerk for Regeneration's release in America, while EMI will distribute it in Canada. 14-18/08/2001: Bryan Mills's film, A Visual Record is screened at the Edinburgh Film Festival, on the private Opening Gala for press and industry delegates. It is also screened for public in the Filmhouse on the 14th at 5.30pm and the 18th at 9pm, as part of the "Made in Scotland" Mirrorball section of the Festival. 21/09/2001: Claire Burbridge, Joby's wife, exhibits some of her paintings in London for a month a second time. She will be at the gallery the following day, Saturday 22nd. 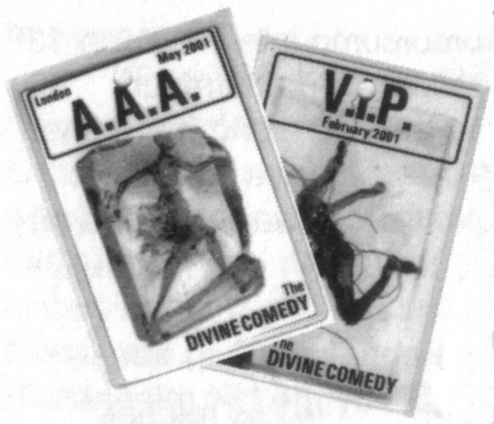 • As the Regeneration tour gets to its end, Neil and Ivor start an acoustic tour in Spain. The lives get another sound and they take the opportunity to play more older songs. 05/10/2001: Neil gives four interviews: one on the phone, one for AB magazine, one with COM Radio and one with Doctor Music.com. 08/10/2001: Release in France of a limites edition of Regeneration including a bonus CD which features B-sides along with thevideo of the film A Visual Record which was until then only available on RE:Regeneration. 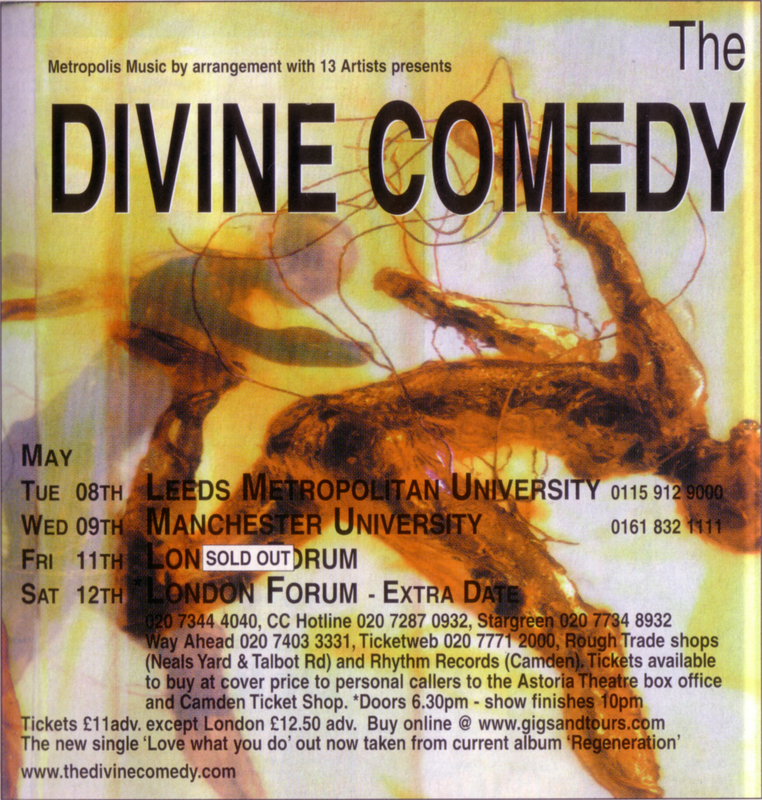 23/10/2001: The Divine Comedy confirm their decision to split. 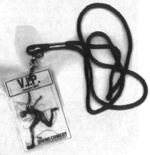 Some rumours of the split were already announced a few days before but nothing was confirmed. Neil will continue to record for Parlophone as only he signed to them, contrary to what some people claimed. He doesn't know yet if he will keep the name The Divine Comedy or not. The band immediately give up rehearsals and won't redord any album in February 2002, contrary to what was planned. 23/10/2001: QFM / Beat 106 / Q96 ??? 06/11/2001: Regeneration album released in USA and Canada. 19/12/2001: Neil becomes father for the first time with the birth of a baby girl named Willow Mary Erin Hannon born at 4.15 that afternoon weighing 8.5lbs.